Jon’s new game. We spent time figuring out how to set up and play. Each one of eight rounds is the same, with some extra scoring after the fourth and last. We had a mitigated version of the luck mechanic, but I rolled terribly and Jon rolled well, you can either get an extra action, a penalty action, or nothing. If the luck evens out then it doesn’t matter that much, and it probably would have. In addition I made a few mistakes, so I was behind. We stopped after two rounds because we understood how the game worked and it was taking a long time. We’ll try again, possibly with some rules adjustments. 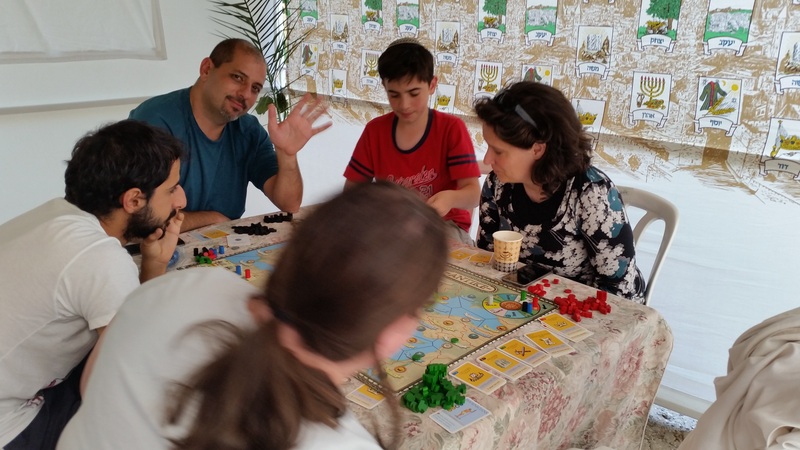 A nice game, but repetitive, and there does not seem to be much player interaction. First play for David and Lorenzo, they liked it as a quick game. We may have played wrong since I don’t remember everything and the rules are in Chinese. Or Japanese. We were going to play to 500 because it was late, when we stopped Jon and David were just shy of it, and Aaron and I were negative. We would, or should, have gotten better hands later in the game, but Jon and David are both better players. Jon: This is the first time I played 3-player correctly with castle/mine alternating on one spot of the board. They both took early mines, I didn’t get mine until phases 3 and 4. I took brown buildings that give workers, I sold many goods and I got both bonus tiles for selling goods. Haim had early mines and boats (although I got to six quicker) and most brown buildings. Sara had animals and bonuses for animals, and finished castles first but no mines. She also tossed out hexes a few times. First play for Lorenzo so no peek at the market. He did well but it’s a hard game. I won by a dollar, unusual for me to win. It was a very unusual game. We built slowly, so Step 3 came out right when we switched to Step 3. We ran out of power plants completely, though by then we all had capacity of 17. Crazy first hand. David called Tichu, then I called Tichu, then Jon called Tichu. I had a 6 bomb, Haim had a 7 bomb, and Jon had two higher bombs, so he went out first. I had a good hand, but not good enough for that. We had a few interesting plays. Jon and David won by around 300 points. Light attendance tonight. Haley first came to Games Day, and joins us for our first game night. 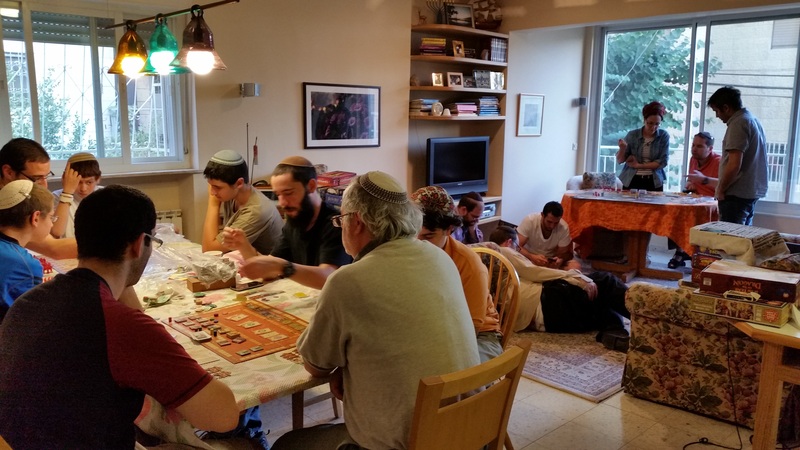 First plays for Jon, Nadine played at a game Shabbaton. Honestly this game may cause some people angst but didn’t give me any cause for thought. It’s in the same space as, but lighter than, and lesser than, Take It Easy. Pick a tile, reserve your next tile and turn order, and place your tile in the pretty much obvious spot. It helps to know the tile distribution, but as you can see, apparently not too much. First plays for Nadine and Haim. This little pen and paper game is also in the same space as the above, but it’s quicker and free to own. Nadine 15, Haim 9, Jon 9? I wasn’t really keeping score since I was planning an infrastructure when Nadine suddenly announced that she won. Didn’t see it coming. Of the four patronages, three of them required rubies and there were no ruby cards available, which hurt my (and Haim’s) infrastructure building plans. Since Haim plays almost purely infrastructure, and I am still toying with a mix, I may have been slightly ahead of him in position. First play for Haley, second or third for Haim. Haley is a true gamer, and she really liked the game. I thought I was slightly behind for the first three phases while Nadine was slightly ahead and Haim was close behind. By the fourth phase, it all looked pretty close to me, maybe I was slightly ahead and Haim seemed a bit behind. As you see, it ended pretty close for all of us, except for Haim who had fewer end scoring tiles. Nadine almost always plays the same three or four paths, but Hayley took one of them from her. Second or so play for Haley. Last time we played, Aaron and I were far behind Haim and CB, and we ended up losing spectacularly. This week Haley and I were far behind Haim and Nadine and we came back from a nearly 700 point spread to win. I won a tichu on the first hand. On the second hand, Haley lost a Tichu and they went out 1/2. On the fourth hand I lost a tichu. On the fifth, I lost a grand tichu and they made a tichu when Haim laid down a 13 card straight on his opening play (and they also got 110 points). Round 7 I made a grand tichu, bidding on a Dragon, Ace, 2 kings, 3 queens, and a 10. After passing I had Dra, A, A, A, K, K, K, Q, Q, Q, J, J, 3, Dog. I predicted that my opponents would have multiple bombs, which they did (one each), and yet I still wasn’t worried about making my bid. Round 8 I made another tichu. Round 9 they made one. Round 10 I made one. Round 12 Haim made a grand tichu, and the score was 990 to them, 810 to us. No one called tichu on round 13, but with some careful play we managed to both go out first. A lot of attendees with more new faces than usual. Thank you to everyone who helped set up and clean up, a big help. Thank you especially to David for taking care of the long food order. We ordered from Pollo Loko for the first time. David had them read back the names for each item, but the order came without any names, missing one item, and without silverware or napkins. When David called to complain they said people need to request those. You would think with a large order they might ask if we want? We played one hand before switching to Tichu, Avi made the 3NT that we bid. Gili taught this, first play for the others. 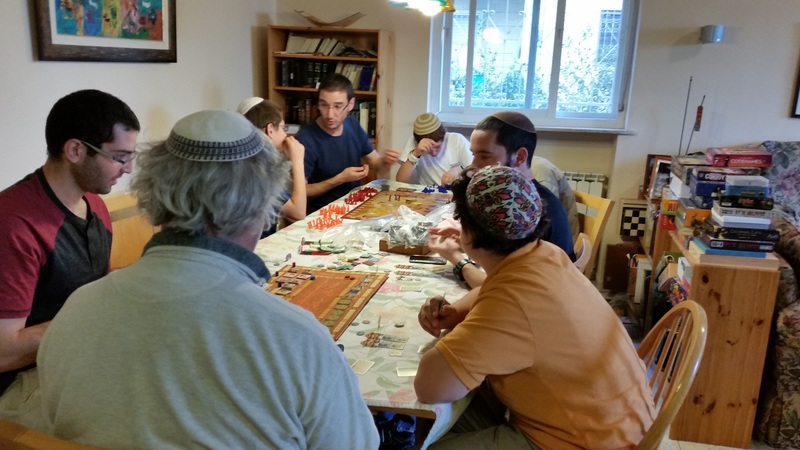 Jon: I taught this to David C, Avi Einot, and Yokhay, and they all liked it. 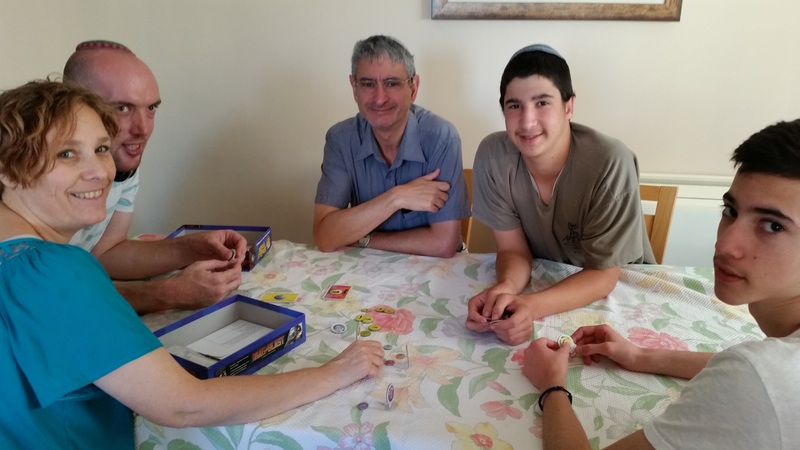 In the first game, Avi and I gave clues, in English to David C and Yokhay, which didn’t always go so well since they are Hebrew speakers and we are English speakers. 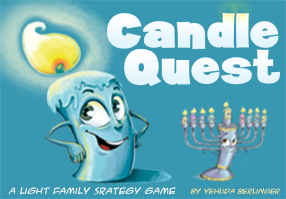 In the second game, Avi gave clues to me in English and Yokhay gave clues to David in Hebrew. Sometimes they switched to English in order to give a clue that is one word in English but two words in Hebrew. Eszter taught us. Then when we saw Ezra wasn’t playing a game, she taught it again to him. After being interrupted by dinner, Ezra ended up leaving, but we finally played. I didn’t get all the rules right away, even when I did, I didn’t like the resource movement mechanic. 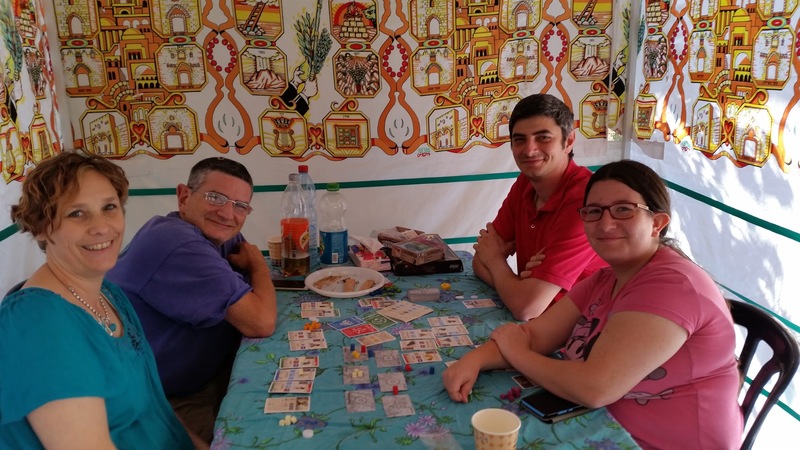 Eszter helped us with recommendations, David liked the game. I killed Gili, David and Yedidya, but then Avi killed me to win. New to both, they liked the game. Before counting most and least money, Shneur had 32, Nadine 30. David says Jon is on a long winning streak. Jon: David and I drafted cards and I ended up with a relatively tight deck that had some fliers and creature control, but nothing else spectacular. In the first game, I drew as well as I could have, but I had limited land after the initial opening hand and David took me down with bigger creatures.after killing my fliers. In the second game, David was entirely mana screwed, with a hand full of blue cards and no blue lands. In the third game, I was able to eke out another win where both of us had average draws. Ben didn’t win, I don’t know who else played. Gilli and Cliff won together. Jon: David made one strategic and one tactical mistake in the penultimate and ultimate rounds. Avi thought it was too hard to catch up once ou were losing (although with more experience, hopefully no one will be losing by too much). 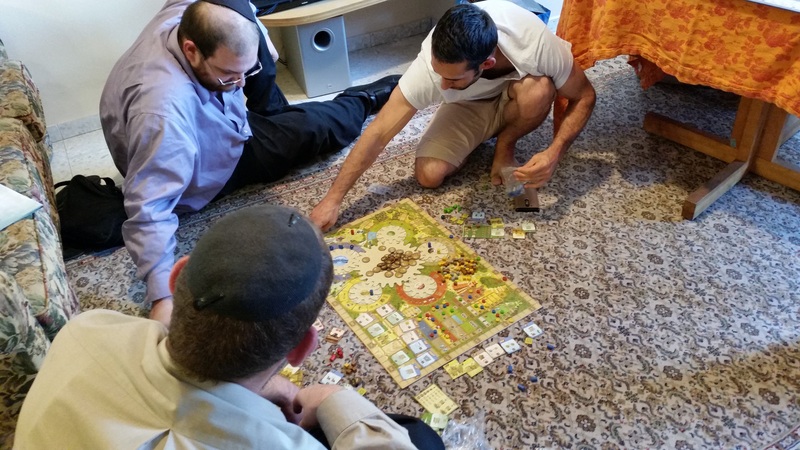 I taught the game again to David, Avi, and Aaron. I hadn’t played it in a while, and we are not sure that we got the action card availability mechanics correct. David took a wide lead in the middle of the game and held it, but he spent one round too long building up his infrastructure. I used that one round to gain a huge amount of victory points; that was the penultimate round. On the last round, he neglected (forgot) to deprive me of a card I used to keep my lead. While I would have gotten almost as many points anyway, it was a mistake. First play for Ben, second for Assaf. Ben complained the whole time that he wasn’t getting the game, and about his limited possibilities, though of course he did well. I don’t think he liked the game despite winning. He’s right about the luck elements, such as which flag tiles are available and which ones you need. 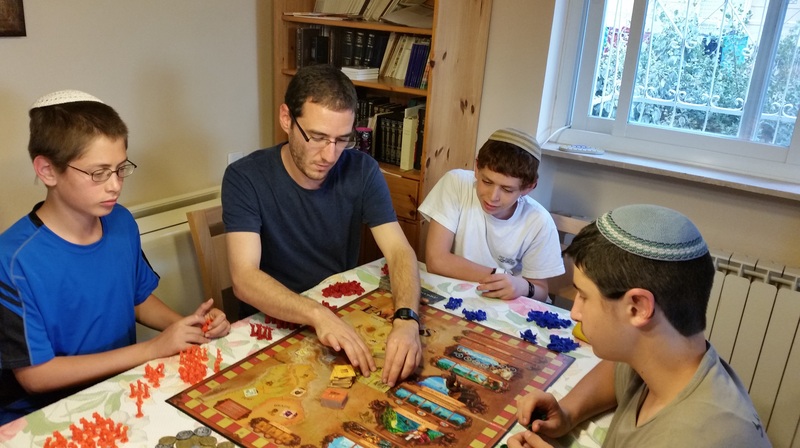 Assaf did well with marrying daughters into cities, he placed them all in one city which limited his end game bonuses, which lost him 8 or 12 points, and he didn’t invest in many white discs. I concentrated on the book track, not enough to beat Ben’s training of sons – and he also got points from the book track. Jon: I taught this to several new people and played several times. 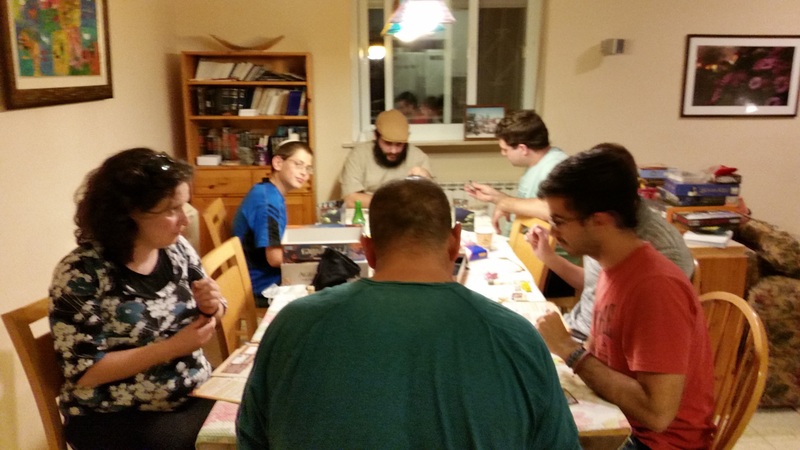 Many people liked the game a lot, especially David C (guy from my work who came for the first time), Avi Einot, and Yokhay Liot (the last two guys are new to me and I met them at the end of the evening). 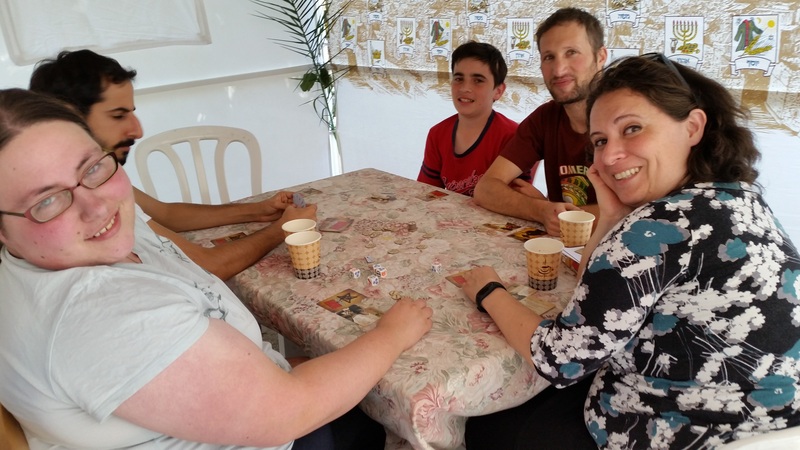 Jon: first plays for Yael, Nati, and David C, who all liked the game. I invited them to gang up on me, and they did some of the time but not all of the time. They also all played very well, but I managed to get a 2 or 3 point lead by mid game and just managed to keep hold of it until the end. Avi and I had a pair of kings overtaken by a pair of aces twice, ruining our plans. 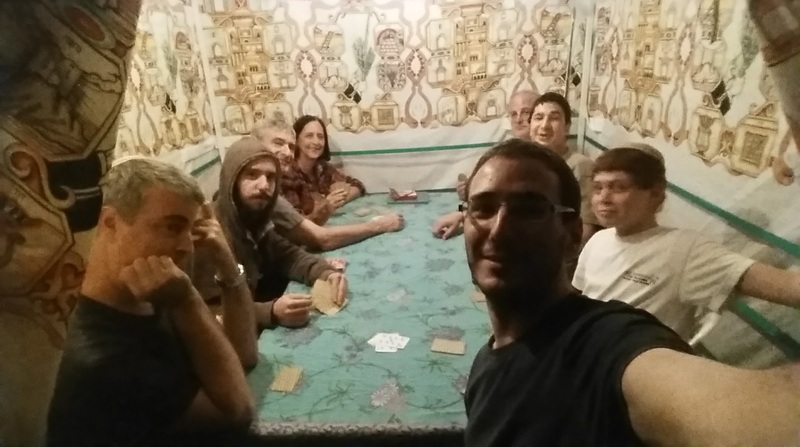 Jon: I played with Assaf’s friend Yechiel from Kokhav Hashachar (first play) against Aaron and Shnuer (first or second play). 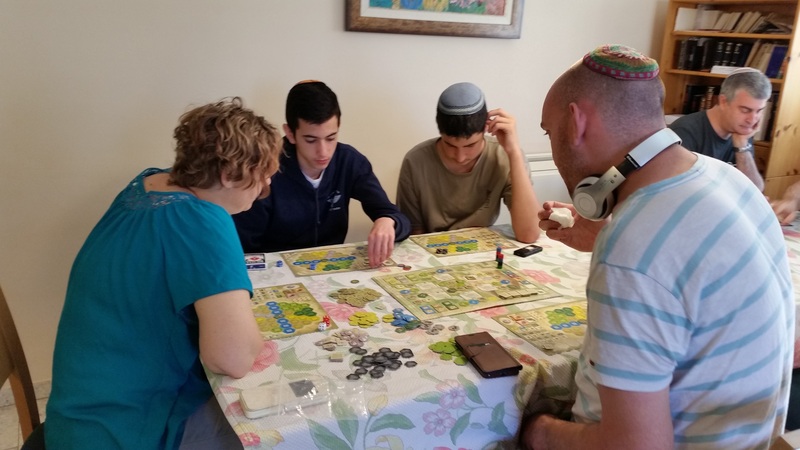 Yechiel made some beginner mistakes, but played very well for his first time. He even called Tichu twice (made it once). I called it three times and made it twice. In one of the times I made it, Aaron on my right played his second to last card (a 7) and I called Tichu, which shocked him. I played an 8. Luckily for me, my partner played his K so Aaron could not play his last card, which was a K. I overtook my partner’s K with one of my aces, played a long straight, then a full house of Q’s over aces, and then got out with the dog. In another interesting hand, I pulled in my opening 2 aces, 3 Q’s. 3 tens, a straight 2 to 6, and the phoenix. David and Avi’s advice for passing was to pass one 10 to each other player, but I decided to pass the 2, 3, and 4. I got back 2 4’s and the dragon, making an easy tichu. Aaron also called and made or lost some tichus. At one point, one hand took us from 795, and them at 105, to us 695 and them 405, and then us 695 them 605. But those two hands were their only streak. In the next hand it was 995 to 605, and then 1195 to 605. New to everyone except me, Ben had played once. This is a very hard game to get on the first play but they all did well, especially Ben. Assaf jumped ahead of me in turn order before the game and took a dragon, I took one on the next round. Ezra started with Books but couldn’t maintain it, no one else focused on it either. Ben had a lot of people, but was slower with round points. I did single building for a while until I finally took a builder. I took a Monk at the beginning for turn order, and was unexpectedly able to keep him til the end of the game. I got one double one, Ben had two double ones. 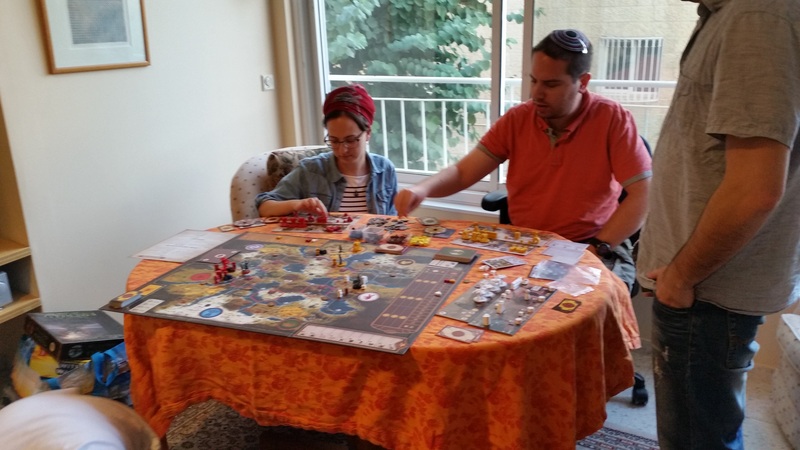 We got to teach Nisan a game. First play for Nisan. Nisan went first and, on our advice, picked up the bonus tile that gives 3 points per type of good sold. Gili took the bonus tile that gives 4 points per type of animal. Nadine and I fought over mines and the building that gives workers, and so stymied each other somewhat. Nisan also got the bonus for completed section tiles, and he acquired 4 of them. In total, he ended with more than 60 bonus points, more than Gili. Gili has the second most, but had gained more points from her animals and sections completed early. I also had small sections, but I couldn’t complete enough of them early enough. Nadine had larger sections. At game’s end, Nadine gave up one set of bonuses for another which allowed me to score more than her, even though I also gave up one set of bonuses instead of another as a return favor. So we both could have scored less, but I would have scored even more less.